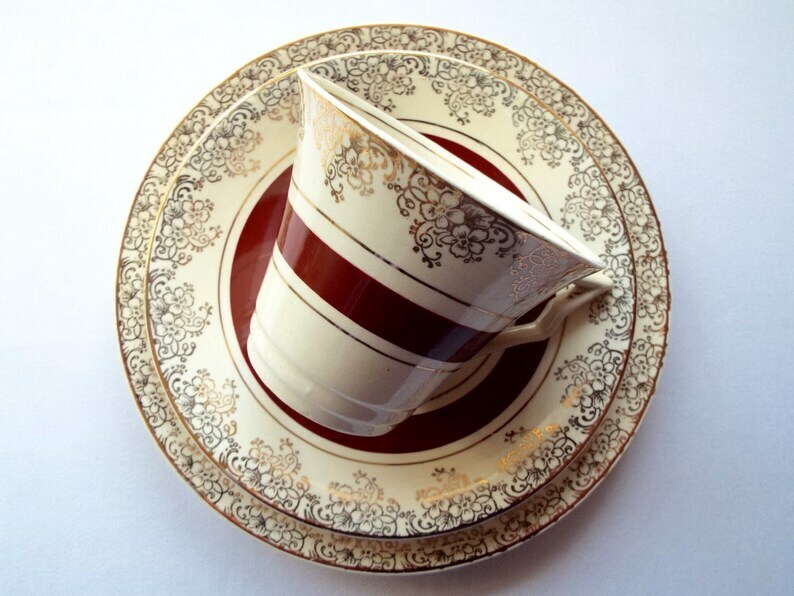 A beautiful late 1940s/early 1950s pretty rich red, cream and gold trio by famous English firm Burlsem Midwinter, stamped with their 'porcelon' back stamp. Burslem Midwinter is now very collectable and this piece is a good example of their post war retro Midcentury style that is now so popular. 'Porcelon' was the label covering the company's semi porcelain products. This trio is very stylish and would look great on a vintage afternoon tea table - it deserves to be used and loved again! When not in use it would also look beautiful displayed in a cabinet. The cup is a very strong and eye catching shape. I now have just one of these trios left available. There are no chips or cracks. There is some crazing to the glaze, which can be seen in photos 6 - 10. This is typical of pieces from this era, with their thick glazes and dies not affect soundness or usability. There are a couple of little scratches to the burgundy band on the saucer. There may be some slight wear to the gilding and gold pattern in places. All these points are commensurate with age and use. If you would like further photos, please just ask. Any further marks or blemishes are commensurate with age and use. Please remember this is a vintage piece and therefore cannot be expected to be in perfect modern and new condition. Your trio will arrive carefully packaged and wrapped in vintage style brown paper and ribbon. I've used all the available photo slots to show the beauty of this item, so please see my other items for examples of my gift wrapping.